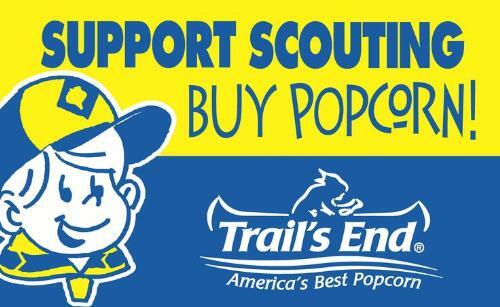 Pack 58 participates in Trail's End popcorn sales throughout September and October. Part of the proceeds for your sales goes directly to your scout's personal account to offset any personal costs, and the remainder goes to the pack to help fund our events for the year. Scouts can also earn prizes for selling popcorn. Go to the Trail's End website. Click on "Register" in the upper right hand corner. On the "What type of account..." page, select "Parent, On Behalf Of My Scout"
Enter your information and your scout's information on the next two pages. Create your login on the third page. On the last page, select council "Western La County", district "Bill Hart", and unit "Pack 58". Direct sale order forms and money must be turned in by October 22nd. These orders will be filled in November. Online sales continue into mid-November. Orders will be shipped directly to the buyer.